Funeral location: Fremantle Crematorium, West Chapel, Sainsbury Rd, Fremantle, W.A. Condolences to the Serving Member, their mates and family. Passed away tragically on 15.10.2018 aged 50. Loved and adored son of Margaret, Gary and Elsa. Much loved brother and brother-in-law of Sharon (dec), Ryan and Sonia, Lisa and Scott, Glen and Kylie. Loving and supportive uncle to Stacee, Jayden, Cassidy, Connor, Lachlan, Katie and Hollie. IGGLESDEN (Darren): Our heartfelt condolences, love and prayers to Margaret, Gary, Ryan, Lisa and families. No words can explain how much you will be missed Igy. So grateful to have had you in our lives all these years. So many wonderful memories that will always be cherished. Love Fieldsy, Linda, Tayla & Jordan. IGGLESDEN (Darren ): To all Darren’s family and work colleagues. Our thoughts are with you. Iggy worked with us for quite some time, he was a top operator, driver and mate. R.I.P Iggy. IGGLESDEN (Darren ): Our heartfelt sympathy to Margaret, Gary, Ryan, Lisa and families on your sad loss of Darren. Thinking of you all. Love Ed, Sev, Susan, Caroline, Joy and families. Our deepest sympathy to Margaret, Ryan, Lisa and families on the loss of Iggy. He will be sadly missed by all of us. IGGLESDEN (Darren ): Our deepest sympathy and love to Margaret, Gary, Ryan, Lisa and families. Iggy you have been our friend forever and can’t imagine our lives without you in it. Our hearts are broken but take comfort you will remain in our hearts forever. Our condolences to the Igglesden family, please accept our deepest sympathy for the loss of Darren. Our wonderful, caring and respected colleague. We cannot begin to imagine what you are all going through. May time heal your hearts and memories comfort you. 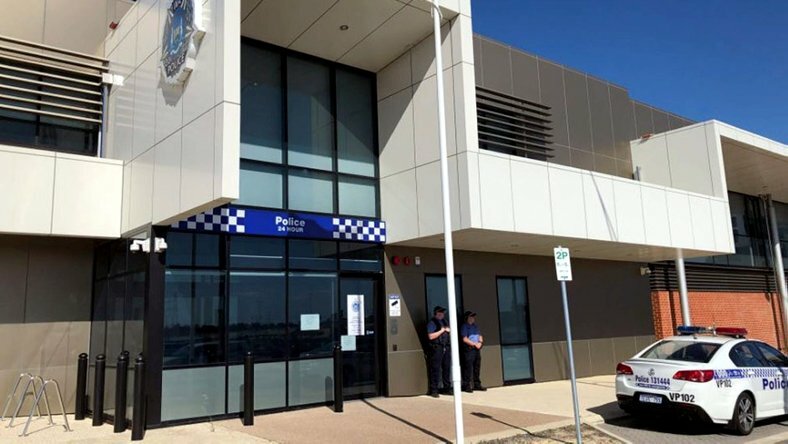 Fremantle District Office, Cockburn Police. Iggy, how lucky I am to have known someone who was so hard to say goodbye to. 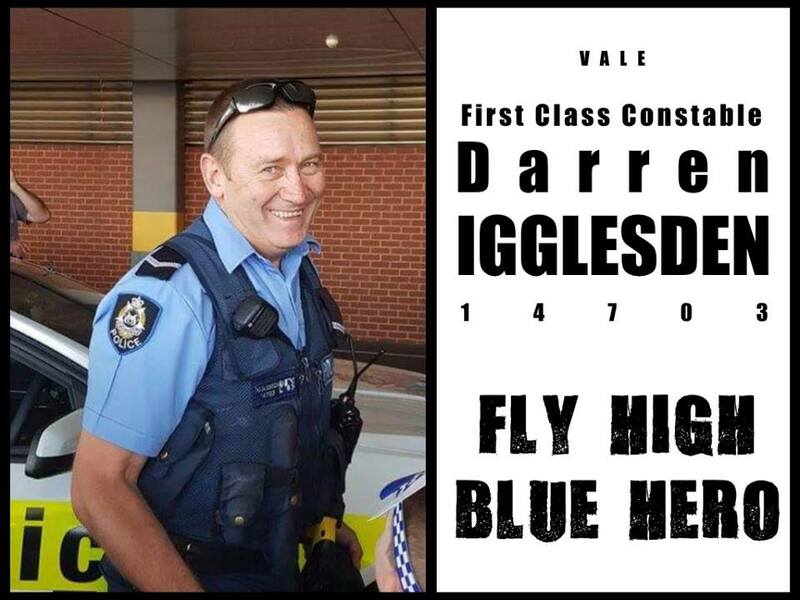 The Commissioner of Police and all members of the Western Australia Police Force regret the passing of our colleague First Class Constable Darren Igglesden Registered Number 14703. Deepest sympathy to family and colleagues. Deepest sympathy to Margaret and all your family. Hard to believe your loss. Thinking of you all. Colin, Pat, Della, Dale and family. Our deepest sympathy to Margaret, Ryan, Lisa and families on your sad loss of Darren. Gone too soon. IGGLESDEN (Darren ): To all of Darren’s family, friends and work colleagues, the Freeman family offer our sincere condolences. A cherished family friend who will be deeply missed by all. Margaret, Ryan, Lisa, Gary and families, our heartfelt sympathy. Much loved brother to Lisa and brother-in-law to Scott. Loving uncle to Stacee, Jayden and Connor. Our lives are never going to be the same. Wonderful memories we have that we will never forget. You are so loved, our hearts are so broken. To have and to hold in our hearts forever.Our deepest sympathy to Darren’s fellow colleagues. Our lives have changed forever. You were always there in times of need. Your love for your niece Cassidy was unconditional. We will never forget all the good times we shared, times that will never be the same. Our love and thoughts to the WA Police Department and Darren’s fellow colleagues. In the hearts of those he touched. 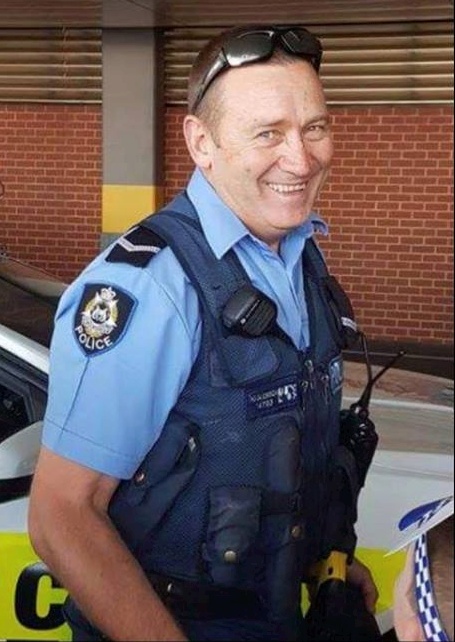 The Funeral Service to celebrate the life of Darren “Iggy” Lloyd Igglesden (First Class Constable 14703) of Beeliar will commence at the Main Entrance of FREMANTLE Cemetery, Carrington St, Palmyra on FRIDAY (26.10.2018) proceeding to the West Crematorium Chapel by 11.00am. Police say it appears the officer died as a result of a self-inflicted gunshot wound at Cockburn Police Station this morning. It’s the third case of a West Australian police officer taking their life on the job in the past 10 years. The WA Police Union and Medically Retired WA Police Officers Association have long called for more support, saying many first responders reported having suicidal thoughts after witnessing traumatic events. In July 2015, Detective Sergeant Scott Blanchard took his own life while travelling with workmates to Kalgoorlie for a police operation involving Gypsy Joker bikies. Deputy State Coroner Evelyn Vicker recently handed down her findings following an inquest into his death. “I recommend WA Police health and welfare division use the police intranet to emphasise to serving members that their families should be made aware of the availability of its services,” she said. In December 2008, Senior Sergeant Elliot Watt shot himself in the armoury of the Collie Police Station. It was the first day back at work for the father of four after three weeks of annual leave and he had just assumed the role of acting officer in charge. Readers seeking support and information about suicide prevention can contact Lifeline on 13 11 14, Suicide Call Back Service on 1300 659 467 and beyondblue on 1300 22 4636. Police say it appears the officer died as a result of a self-inflicted gunshot wound at Cockburn Police Station on Monday morning. WA Police Force Commissioner Chris Dawson has revealed how he attended the suicide of a colleague as a young 20-year-old officer. The state’s top cop said work across the community needed to be ongoing to ensure those who wished to speak up and seek help for mental health issues were not seen as being weak. Mr Dawson made the comments on Thursday morning on Gareth Parker’s 6PR Morning Show. He was speaking in the wake of the tragic death of a WA police officer who died at Cockburn police station on Monday. First Class Constable Darren Igglesden, 50, is believed to have taken his own life shortly after reporting for duty at 6am. Mr Dawson said he visited the police station on Wednesday where he spoke openly to First Class Constable Igglesden’s colleagues. “I’ve dealt with suicides before,” Mr Dawson said on Thursday. “I attended a suicide of one of my colleagues as a 20-year-old, so I personally understand what they are going through. “When it’s one of your own, it hits that much harder. “It probably galvanises you to the reality that you are mortal and while police put on uniforms and we get given powers and authorities … you’re not immune from the frailty of human life. Mr Dawson said the agency was putting much greater emphasis on following up with officers who have attended confronting incidents. “We also need to address any sort of perceptional culture that it is a sign of weakness if you ask for help,” he said. At a press conference on Monday Mr Dawson said First Class Constable Igglesden’s death had come as a complete shock to his family, friends and workmates. Blue Hope, a not-for-profit group whose aim is to highlight police officers’ mental health issues nationally, posted to its Facebook page on Tuesday a photo of the 50-year-old in his police uniform. “We will probably never know why Darren took his own life but what we are absolutely sure of is the fact that WA, this country and in fact the world is now less one hero,” the post read. If you are experiencing mental health issues contact LifeLine WA on 13 11 14, the Suicide Call Back Service on 1300 659 467. WA POLICE UNION Members are invited to attend the Funeral Service for our late serving member Darren Lloyd Igglesden 14703 at Fremantle Cemetery on Friday (26.10.2018) at 11.00am. WA Police are investigating the death of an officer at a police station in Perth’s southern suburbs. It is understood First Class Constable Darren Igglesden, 50, died from an apparent self-inflicted gunshot wound at Cockburn Police Station on Monday morning. In a statement, WA Police said support services were being offered to other officers. The station has been temporarily closed, and the public has been asked not to attend the station until further notice. They have instead been redirected to nearby Fremantle or Mandurah stations, both of which operate 24 hours a day. Police Commissioner Chris Dawson extended his condolences to the family of Constable Igglesden and colleagues at Cockburn Police Station. “It appears Darren has drawn his service-issued pistol from the police armoury this morning (Monday), shortly after 6:00am,” he said. “He was found deceased by colleagues within the Cockburn police building. “Darren’s death has come as a complete shock to his family, to his friends, and indeed the entire police force. “At this difficult time I extend my condolences to Darren’s family, his friends, his work colleagues and everyone who knew him. Commissioner Dawson said Constable Igglesden was a popular member of the police force. “Constable Igglesden has been with the WA Police Force for six-and-a-half years, he joined us at about 44 years of age, he has had a varied career in the private sector prior to joining police,” he said. The tragedy comes nearly a month after WA Deputy Coroner Evelyn Vicker released her findings into the suicide of police officer Scott Blanchard, who shot himself while on duty at Kalgoorlie in July 2015. The inquest into Sergeant Blanchard‘s death heard details of the WA Police Service’s Health and Safety Division, which provides services such as confidential psychological counselling, peer support programs and chaplaincy services to officers and their families, to try to help them manage stress or issues that may arise as a result of their employment. Police Minister Michelle Roberts said she believed the culture within the organisation was changing. “I think the police force has changed dramatically over the last 10 years or so, in terms of encouraging officers to come forward and to show some additional care for themselves and their fellow officers,” she said. “It used to certainly be the case that the attitude was ‘toughen up’ and to show any emotional vulnerability was seen as some kind of weakness. That’s not the attitude that’s been taken by police in recent years. “We have had some shocking and tragic incidents in recent times where officers have had to turn out to shocking scenes, and sometimes they go to road crashes where they see shocking scenes, so we need to know that they have got the support there.